Substitute crab stick with real crab meat or chopped shrimp if you desire. 1. Bring the broth to a simmer over low medium heat. 2. 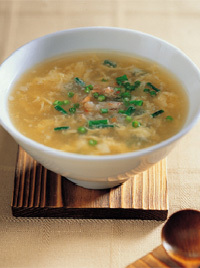 Put sliced crab stick into chicken broth. 4. Add white pepper and salt. 5. Continue to cook until egg is done. Remove from heat. 6. Garnish with scallion. Serve promptly.